The target age for this story is Middle Grade and it reads appropriately for that level to me. The story is wonderfully imaginative and sends three teenage protagonists on quests and through adventures that would definitely appeal to young readers. 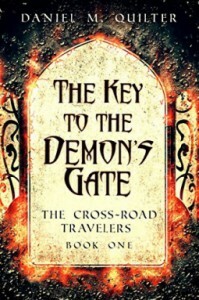 Henry Rockwell and his friends get whisked away into a fantasy world adventure with demons, pirates, magic and of course a quest. Though the character development and plot were fairly average for the age group, I think younger kids would enjoy it. My only complaint is that it ends with some of the details of the story unfinished and an invitation to continue the adventure in the next book. I'm becoming less tolerant of this sales approach as more authors do it and although I don't mind it in favorite adult or YA series, I think it sends the wrong message to younger readers and feel that even a series should conclude the adventure at hand and act as a stand alone. How can you encourage reluctant readers to take an interest if the story never ends? Or takes three or more books to do so? Overall an okay story that would sit well in a children's library one the series is complete.